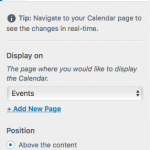 These are the settings for displaying the Calendar on your website. You can get to these settings by going to Appearance > Customize from your WordPress Dashboard and clicking on the RockPress panel. This is the page where you would like to display the RockPress Calendar. 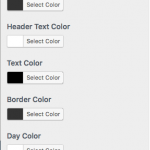 You must first create the page from the Pages menu of the WordPress Dashboard. After the page is created ,you may select it from the list. This specifies where you would like the calendar to be displayed. Either above or below the page content. This allows you to select any combination of calendars from Rock and display only the events on those calendars. 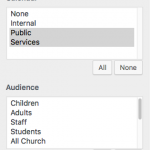 You can also limit which events are displayed by selecting specific audiences. With the color settings, you can override most of the colors used in the Calendar.